Oakland artist and former Laney student Milton Bowens poses questions about African Americans in America with his new collection, “The Discovery of Urban Cotton Fields” featured at the June Steingart Gallery in the lobby of the Laney Administration Building. 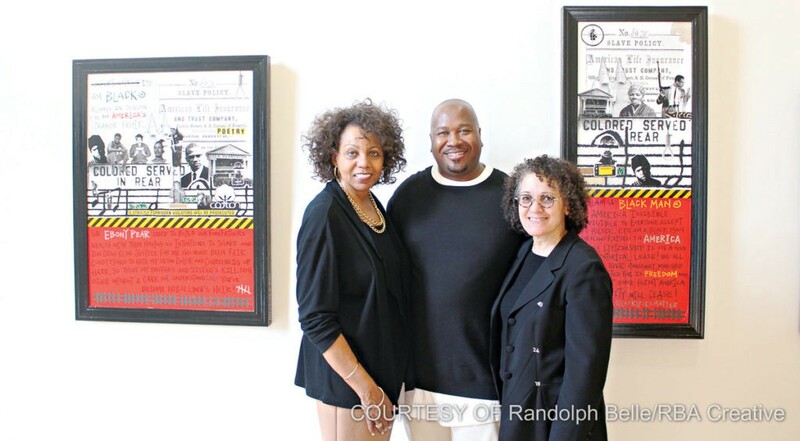 Laney Interim President Audre Levy, artist Milton Bowens and Gallery Management Professor Dr. Leslee Stradford (left to right) pose in front of Bowens’ artwork for the “The Discovery of Urban Cotton Fields” art show. Bowens studied illustration while in the Army before finding a mentor and changing his focus to fine art and mixed medias when he met former Laney art professor David Bradford. Bowens is influenced by the styles and works of Jean Michel Basquiat, Robert Rauschenberg, Romare Bearden, Jacob Lawrence, and Andy Warhol. Bowens weaves images of slavery and oppression with well-known black entertainment figures using a dramatic mixed media assemblage in the collection presented at the Steingart Gallery. He paints pictures of African American history that demand the viewer look closer, and more importantly, question the meaning of each detail. 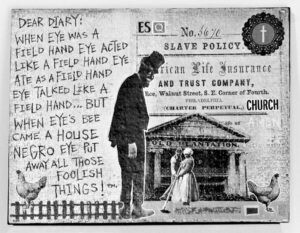 In the title piece of a series of diary entries called “The Puzzling Diary of Tom Shuffle Esquire,” he combines the picture of Bert Williams in blackface, a famous African American vaudevillian from the 1900s with a copy of an American Life Insurance slave policy, numbered 3670. Each diary entry includes the same slave life insurance policy, with a different entertainer’s face, from Uncle Ben and Aunt Jemima, to Tupac and Ice Cube, mounted on canvases made cleverly from puzzle pieces. Bowens makes a clear connection between slavery and a system of oppression perpetuated through entertainment. African Americans in entertainment participated in this system, some performing in blackface, others embodying the many stereotypes created for them. 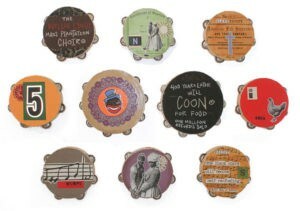 Pieces from Milton Bowens’ art installation titled “The Willie Lynch Mass Plantation Choir.” It features a wall covered with colorful, painted tambourines, collectively asking questions about how African-Americans see themselves. Another collection composed of colorful, painted tambourines with the title “The Willie Lynch Mass Plantation Choir” again plays with the theme of entertainment. But here Bowens uses the famous Willie Lynch letter theory as his backdrop. The Willie Lynch letter or “Making of a Slave” is the story of a West Indian slave owner, who supposedly came to Virginia in 1712 to teach people how best to control their slaves. It is widely considered to be a hoax, due to certain vocabulary in the letter not being appropriate to the time period. In Bowen’s mind, whether the details of its delivery be fact or fiction, the words remain documented and understood as a mental conditioning to subjugate the African American. In “The Puzzling Diary of Tom Shuffle Esquire,” Laney Student and featured artist Milton Bowens creates a mixed-media piece criticizing the paralells between slavery and systemic opression of African-American entertainers. He asks how society sees African Americans, and then asks how they see themselves. Is the mental conditioning described in Making of a Slave relevant today? How do we deal with it, and more importantly, how does the African American community? When asked what he wanted to say with the collection at the Steingart Gallery, Bowens responded that he always makes a conscious decision in his art to provoke questions. He spoke of the repercussions of slavery and the trauma that was reinforced through the Jim Crow laws, extreme poverty and a prison industrial system. He also asked where the support groups and rehabilitation is for African Americans dealing with this trauma. Bowens sees his art as a kind of therapy for the African American community, a way for everyone to look deeper and ask questions.